Started in 2004, Rooms Today Outlet is the culmination of the definitive changes that have occurred in retail over the last 30 years, but hasn’t happened in the furniture business. Furniture, in most cases, is still bought and sold using methods of the 1950’s; pressured commissioned salespeople, ordering and waiting for merchandise with a large deposit required, and large showrooms with space being devoted to vignettes. Today’s retail customer wants immediate satisfaction without the waiting and hassles. Without the pressure of commissioned people who follow the customer and only make money by ‘selling’ the merchandise. And, of course, the ability to return without the stores thinking the customer is a criminal. The success of new retail, from Limited and Wal-Mart to Ikea, is proof of the changes taking place. Yet furniture tends to be a mom and pop business, even among the so-called big stores, with high markups and slow turns. Throw enough stuff on the floor, and somebody will buy it. Be all things to all people. At Rooms Today, we carry only the best-selling items in the country and we have them in stock and ready to go at a price that other stores can’t compete with. 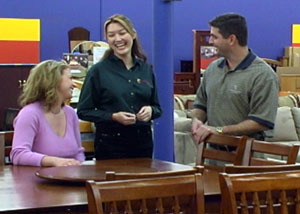 Without the large overhead of non-productive space and personnel, we’re able to keep our prices at a fraction of what the traditional furniture stores, including their current “best sale ever” price. Without the hype and con, Rooms Today doesn’t need to make a killing on you, we just have to have lots of you.